As you can see – it’s a great piece, but it’s not exactly my style. Like a relic of an old dead media, it seems a bit too much like a “craft”, and is a world away from anything by someone like Damien Hirst, for example. When I was at art college the idea of the “cutting edge” art was drummed into you. Words such as “vanguard”, and “avant garde” were banded about without being really questioned. Likewise, words like “craft” and “creativity” were dismissed. I think you can still see these ideas having a lot of currency in the contemporary art world and its culture. However, those old ideas of what’s “dead media” or not interest me less and less. I think with anything, you have to throw yourself in wholeheartedly. The idea of the avant-garde is a great way of trying to convince yourself why NOT to do something. It stifles action if you’re tied to this idea of only doing things that are cutting edge. It leads you to dismiss avenues that are not cutting edge enough, rather than just trying things out to see where they take you. Of course this brings up all sorts of ideas about what is “good” and why, and who decides what is avant-garde, but that’s out of the scope of this blog post. 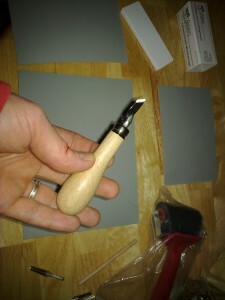 So I’m going to give linocutting a go and see where it takes me. And that idea feels quite liberating already. As you can see from the photo, I’ve already cut my thumb just trying to put the sharp nib into the handle, so take great care when you’re using these things. Decide what image you want to print and draw it onto the lino mat. Just remember that the image that you are doing will come out in reverse when you print it. Also – the bit’s that you’re gouging out will not print, so you are sort of creating the image in negative, if you see what I mean. It will print out “not-in-negative”, as it were. When you’ve finished carving out your piece of lino (mind your fingers! ), you roll some paint onto it, then carefully place a piece of paper flat on top of it. Now. At this point you will either need a massive lino press, which is a specialised piece of equipment and jolly expensive, or some very heavy books and something to weight them down with. So which ever it is, press the paper onto the lino. When you’re done, take it out of your press/weighted books, and peel the paper off the lino. There’s your printed masterpiece. Now, if you really want to get clever, you can use a few linos to build up a complicated composite image with lots of different colours. But that’s fiddly and requires a bit more skill and planning. So there we are. I’ll be trying that soon and posting my results here as soon as I’ve done it. Lino tools are fun to use and are lot limited to just doing linocuts, I have used mine on woodcuts, hebel carving and lately soapstone carving. I do recommend making a bench hook (piece of wood a bit bigger than the height of your lino piece, one bit of wood nailed to the top of one edge and one to the bottom of the other end) to save carved fingers. The boy is back in blog town. A highlight of my RSS feed. Ivan, I think you’re right. And I think that’s also what I’m going to try when I start. That woodcutting machine is quite something! I think it might be that I like the hands-on nature of it though, although I don’t want to rule anything out. I work with felt… that is a lot of craft/dead media/ creativity in one word. Its a lot of work, you indeed have to step over your own reservations ‘wholehartidly’ and step over what people have been doing or how you are supposed to do it. The ‘whó .. said so? !’ mentality helps me a lot. Looking forward to a 21st century lino. As I worked larger and larger and wanted to make more and more prints, the carving became physically over-taxing and my body began to wear down. Because the carving is the least ‘artistic’ part of moku-hanga (Japanese woodblock printmaking) and because I made all my block plans in advance anyway, it seemed natural to switch the carving over to machine — the machine carves exactly those areas I ‘plan’ and prints from machine-carved blocks are indistinguishable from prints from my hand-carved blocks… I make a lot of gadgets, but honestly, the ‘art’ in moku-hanga is in the printing — no press is necessary — just a baren and some practice — decent paper makes a huge difference, of course! Linocuts don’t have to be crafty. I try to use the illustrative connotation and then make work which makes the viewer think.